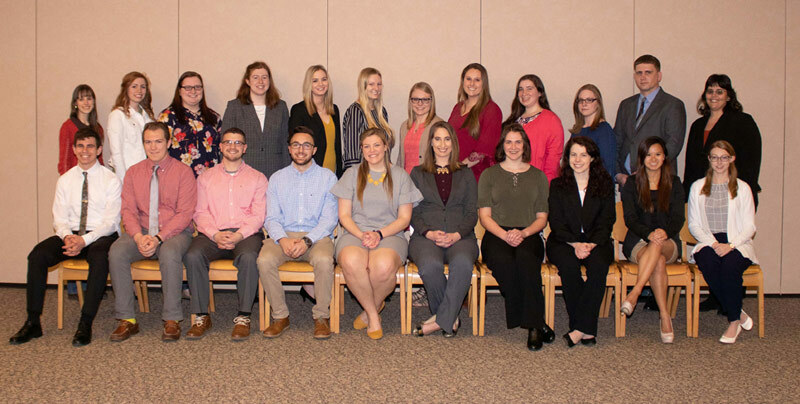 April 9, 2019 - Forty-four King’s College students and two faculty member were recently inducted to the College’s chapter of Delta Epsilon Sigma, the national honor society of colleges and universities with a Catholic tradition. The national organization was founded in 1939 and the King’s chapter was established in 1964. Candidates for membership must have a record of “outstanding” academic accomplishment, a demonstrated commitment to service, and have completed at least 50 percent of their course work for a bachelor’s degree with a minimum grade point average of 3.6. Pictured seated, from left, are student inductees Robert Wachter, Bryce Floyd, Nick Littzi, Dominick Barbarulo, Hannah Bruseo, Kerri Carbaugh, Lauren Sterner, Valerie Warmkessel, Lauren Pham, and Allison Andrew. Pictured standing, from left, are student inductees Sabrina Traver, Zoe Waizenegger, Mackenzie McGeehan, Alyssa Christian, Nicole Berger, Rachel Wallace, Courtney Wager, Molly Clewer, Katelyn Talbot, Bethany Makuta, and John Cassidy; and faculty inductee Dr. Tara Shawver. Absent from photo are student inductees August Axtman, Hannah Bowmaster, Patrick Corcoran, Antonio Duardo, Chase Feeney, Michael Gorski, Rhyce Hammaker, Thomas Hoskins, Madeline Kumm, Justin Kuna, Sabrina Lujo, Connor Logoyda, Jennifer Loughney, Sean Maloney, Megan McGowan, Kyle McKiernan, Nicole Mealey, Nathan Morgan, Devan Pepe, Sam Pipicelli, Freudy Reyes, Erik Webster, and Carol Yaracz; and faculty inductee Dr. Yigit Bora Senyigit.